Some time ago, a friend asked me to get some nuummite and I have to say, once I got some in, I had to have more! Nuummite comes from Nuuk, Greenland (a most remote area too … it is accessible only by boat!) and is a curious agglomerate reputed to be over 3 billion years old! 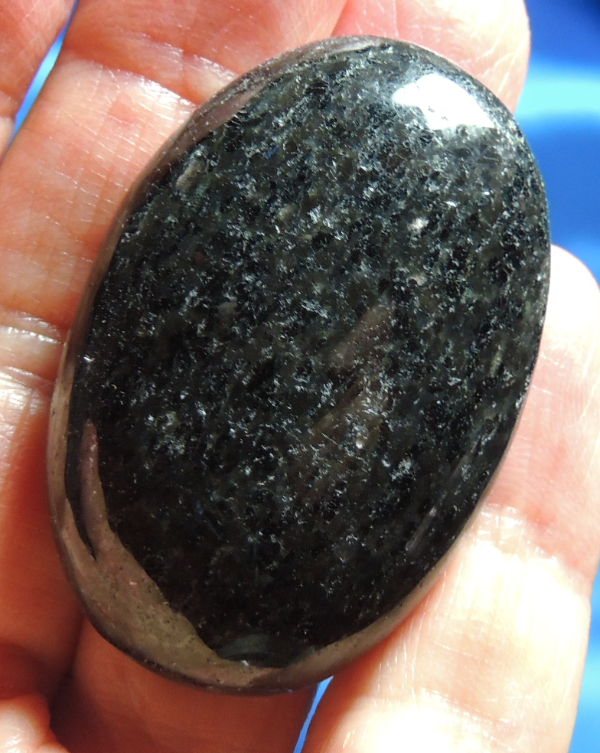 It is a non-descript nearly black mineral that shows a remarkable series of patterns when polished. Nuummite is found in other places besides Greenland, but the Greenland pieces are clearly special. Minute crystals included in the base rock show off their schiller (chatoyant flashes) in colors of gold, blue, reddish and brown, although anything but the brown is rare. This special piece is a 1.2 oz, 1.75” by 1.15” by 0.6” palm stone with loads of character. This is one stone you will not want to be without! OK, I’d heard of nuummite but had never worked with it. I placed my order and when they arrived, one made her way into my pocket and remained there all day and I clutched her in my hand that night. It had been raining for almost a week steadily, interspersed with teaming rains. I get those “low pressure” headaches and all through the week, those low grade headaches sapped my strength and it was hard to do anything. The night I slept with the nuummite, I was transformed … headache gone and I do not exaggerate here … I felt like a million dollars even though it was still raining! My husband experienced the same thing! She is magic personified … balances Chakras, removes blockages, introduces an advanced state of healing. Place her over the Third Eye to open the psychic doorway … she is THAT good and that critical to a Healer’s bundle of crystals. If there was only one crystal to have (heaven forbid!!! ), this one would be the one!